I want to share with you an amazing story of bravery and self-love! Way to go Kirsten for overcoming toxic criticism and challenging times and coming out of it a better person! My story began by being left by my (now ex) husband who claimed that my weight-gain was now too much for him to deal with, and that he wanted a divorce. Fast forward over two years later, a complete life-style change, and almost 60lbs of weight-loss, and I could not be happier with how my life turned out. Having my life totally flipped upside down, being left in a state 7+ hours away from all of my family and friends, I was forced with several difficult decisions. I needed a change, badly, and fast! 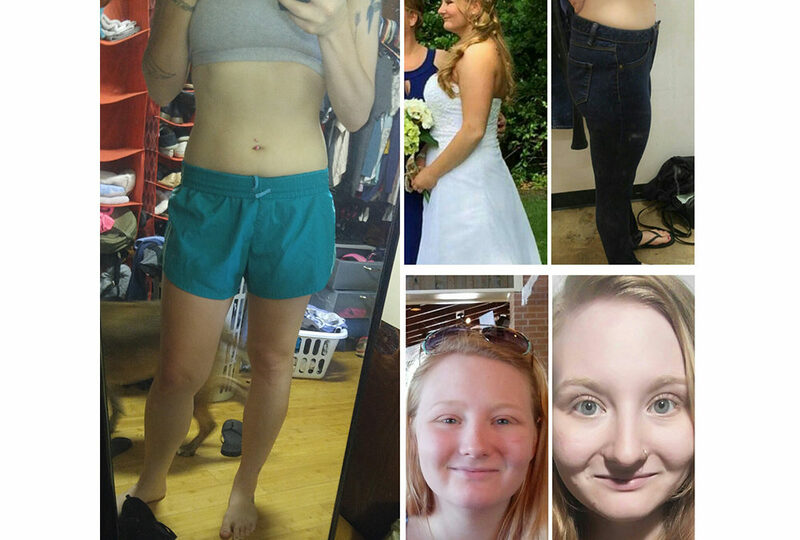 My transformation started out like most others, your generic diets over the years, going through ups and downs, and ultimately never succeeding; but after years of criticism from a toxic partner (that was now out of the picture) I finally decided to make the RIGHT change…to do it for MYSELF. I had stumbled upon the vegan lifestyle in the past, and always thought to myself “that could never be me”, but when I finally stopped making excuses, I returned to the idea of cutting out animal products to become healthier and fitter. My heaviest weight overall was just peaking 200lbs, I did manage to drop down to about 185lbs on my own with minimal and infrequent exercising, and let’s be real, also fasting and starving myself at some points. I started my vegan journey back in May of 2016 starting at right about 185lbs. Since then, I have proudly dropped down to well below my high school weight at a shocking 140lbs and a size 4 jeans (mind you, my wedding dress was a size 14). In the beginning, I did not do much in the way of exercising and yet I still dropped pounds left and right just from eating a simple, clean, whole, plant-based foods. Gradually, I introduced the gym, cardio training, and weight training to my routine and saw an incredible impact on the way my body was toning up and slimming down. Switching to a vegan lifestyle has completely changed who I am as a person. I can now proudly say I have surpassed the original goals I had set for myself, I practice self-love and put my wellbeing first, and have even had the opportunity to race and complete a Spartan OCR Race, which would not have been possible without the improvements from my vegan lifestyle. Every day I wake up more thankful than the last that I switched and made this change for myself and for the good of the planet. Switching to a vegan lifestyle has completely changed who I am as a person. I can now proudly say I have surpassed the original goals I had set for myself, I practice self-love and put my wellbeing first. I have even had the opportunity to race and complete a Spartan OCR Race, which would not have been possible without the improvements from my vegan lifestyle. Every day I wake up more thankful than the last that I switched and made this change for myself and for the good of the planet. We are so proud of you, Kirsten! Keep up the good work. Yes Kristen we are all you proud of your success and you have inspired us all! Thank you for sharing.